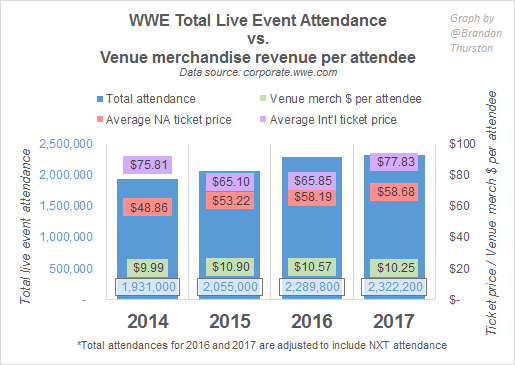 WWE Merchandise Sales At Events Down Despite More Events And Attendance - Wrestling Inc.
WWE ran a total of 384 main roster events across the world in 2017. 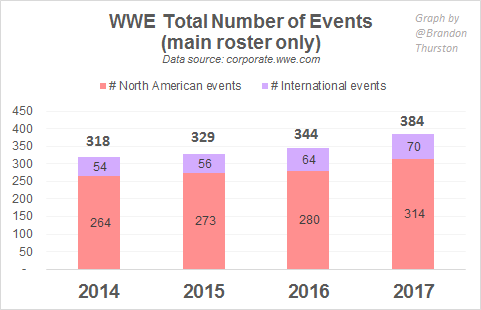 That's an increase of 40 events from 2016, when the company ran 344 events, which is an increase from 329 in 2015 and 318 in 2014. The jump in number of events has correlated with a gradual increase in attendance. 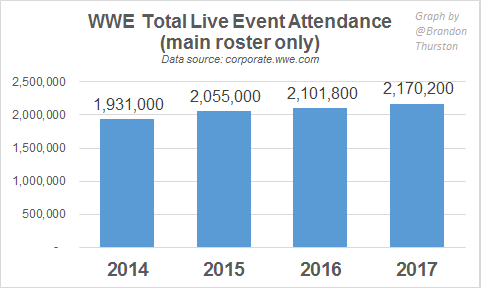 Main roster total attendance has been inching up over 2 million attendees the last 3 years. While total attendance is up due to more events, average attendance is down slightly. More attendees means more revenue from ticket sales. Live Events revenue, made-up of sales of tickets and travel packages, was up 5% from 2016. However OIBDA (a measure of profit) was only up a negligible 1% in 2017. Sales of t-shirts, hats and other merchandise sold at the shows were actually slightly down. 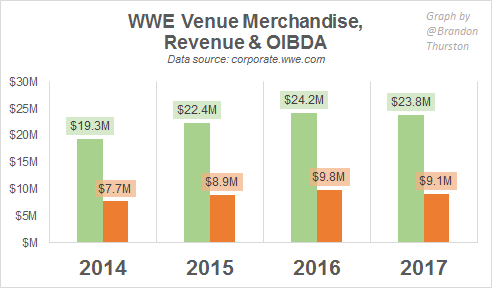 WWE noted in its annual report: "The decrease in Venue Merchandise OIBDA as a percentage of revenues in 2017 as compared to 2016 was driven by product mix and increased venue costs." It's not clear what the changes in product mix were that WWE is referring to, nor what the increase in venue costs might be related to. 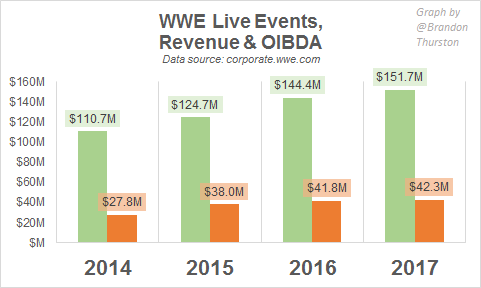 The average person going to a WWE show spent a little less in 2017 versus 2016: $10.25, compared to $10.57 the year prior. Total attendances below for 2016 and 2017 have been factored in NXT attendance. Not making this adjustment would've made the discrepancy greater for average merchandise sold per attendee. 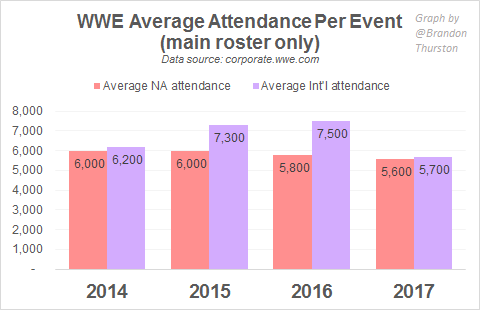 NXT ran fewer mid-size venue events in 2015 and none in 2014. WWE began detailing NXT live event data in its public financial documents in 2016. The brand split, beginning in July 2016 allowed the company to run more live events, particularly untelevised house shows, as WWE form two separate touring rosters, representing RAW and SmackDown. With no end of the brand split in sight, WWE may run even more events in 2018. In January of this year, 205 Live ran one weekend of events, however had to cancel one of the three originally scheduled shows, likely due to poor advance. It should be noted this article focuses only on WWE's live events business. The company's overall business was up significantly. It reported increases in revenue of 10% ($801 million in 2017, $729 million in 2016) and in OIBDA of $13 ($102 million in 2017, $80 million in 2016). Follow Brandon on Twitter at @BrandonThurston. He co-hosts Wrestlenomics Radio, a weekly podcast on wrestling business.